At midnight on 17-18 April 1980 as the flag of independent Zimbabwe was raised for the first time, Tanzania’s President, Julius Nyerere, told the new Prime Minister, Robert Mugabe, that he had inherited “the jewel of Africa.” Since then the “jewel” has become extremely tarnished. Today, Zimbabwe has the highest ratio of debt to GDP in the world, its talented people have fled the country and so too have hundreds of thousands of its unskilled workers. “Catastrophe: what went wrong in Zimbabwe?” is the title of a soon to be released book by Richard Bourne, Senior Research Fellow at the Institute of Commonwealth Studies at London University. The Book will be published by Zed Books, London. Much has already been written about Zimbabwe and its decline since its independence in 1980. There is also a great deal of literature on Southern Rhodesia, as Zimbabwe was known before independence, particularly the Unilateral Declaration of Independence (UDI) by a white minority regime led by Ian Smith. What has not yet been attempted is an account of how a country that emerged with such international goodwill and with considerable natural resources and markets for its products could decline so drastically in thirty years. Bourne’s book is a well-researched investigation of this question. The contention of the book is that the central cause of Zimbabwe’s problems – what caused the racism that characterized the country as Southern Rhodesia; what bedeviled the Constitutional Conference leading to its independence; and what eventually led to its economic collapse, political instability and human rights atrocities – is land. Cecil John Rhodes was one of the biggest rogues to have entered Africa. The Rhodes scholarship, which he endowed at Oxford University, was provided on the back of the most nefarious land grab, in what is now Zimbabwe, ever orchestrated by one man. In 1888, he duped King Lobengula of the Ndebele into signing over to Rhodes’ chartered company complete charge over the metals and minerals in his kingdom “together with full power to do all things that they may deem necessary to win and procure the same”. At the point of a gun thereafter, he proceeded to displace Africans from their land and had no compunction in calling the land he seized, “Rhodesia”, after himself. It was not all plain sailing. Both the Ndebele and the Shona tribes rose up in protest at the seizure and occupation of their land. They were cut down brutally, some even dynamited in caves in which they hid. By 1914, the land available for Africans was only 20.5 million acres out of a total in Southern Rhodesia of 96 million acres. The situation worsened over time. By 1931, Bourne records that “leaving aside the tribal trust lands for Africans not expected to be part of the European economy, 7.4 million acres were set aside for African purchase and 49 million acres for Europeans”. White emigration to Southern Rhodesia was encouraged after the Second World War. And there was every reason for Europeans to take advantage of it. They had access to land they could not purchase in their own homelands; they had a ready source of cheap African labour both for their farms and their homes; and a life style far superior to their conditions at home. The white population rose sharply from 82,000 in 1946 to 135,000 in 1951 and then doubled again to 223,000 by 1960. By 1965, Ian Smith and his white minority government made their unilateral declaration of independence, determined to keep control of Southern Rhodesia and to deny the native Africans their political, human and civil rights. Successive British governments – both Labour and Conservative – refused to intervene militarily to promote majority rule. But all of Britain’s former colonies that by then had come to independence and joined the Commonwealth were determined that racism in Southern Africa should not subsist, and that majority rule should be established. A series of events, well recorded by Bourne including the machinations of Henry Kissinger, then US Secretary of State, and the abandonment of Ian Smith by the apartheid regime in South Africa (by this time more concerned with their own survival), led to the 1979 Lancaster House Constitutional Conference on Southern Rhodesia. At the table were Ian Smith and his African puppets. So too were Robert Mugabe and Joshua Nkomo leading two separate groups, but recognized by the international community as the genuine leaders of the African people of Southern Rhodesia. Chairing the Conference was Lord Carrington, the British Foreign Secretary. And, behind the scenes, Shridath “Sonny” Ramphal, the Commonwealth Secretary-General from Guyana who as Bourne puts it, “was emphatic that he wanted an end to racism in southern Africa under his watch”. It is clear from Bourne’s account that Carrington had no interest in reaching a solution to the land question which came up time and again, and was almost the cause of a walk-out by Mugabe and Nkomo. A last minute undertaking, worked out by Ramphal with the US government, was what persuaded them to stay. The US President Jimmy Carter agreed to funding that would allow compulsory land purchases. It was an undertaking never kept by Carter’s successor Ronald Reagan or any US President since. In the years since Zimbabwe’s independence “land starvation” became a central issue for Zimbabwe Africans, particularly those who were the soldiers in the fight for freedom in both Mugabe and Nkomo’s parties. 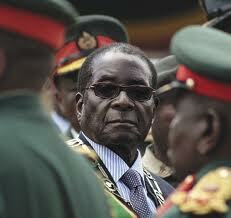 Their’s was an agitation, Mugabe could not ignore. Unable to fund the compulsory acquisition of millions of acres of white-owned farms, Mugabe resorted to seizing them and the economy started its rapid decline. In short order, the country became a basket case with inflation so high and the value of the currency so meaningless that the Central Bank actually printed $100,000 notes. The price of a loaf of bread reached $825. Unemployment soared to 60% and people were starving. Over time, the land also fell into the hands of the political elite. As Bourne points out, in November 2010, “Mugabe and his wife Grace owned fourteen farms and each minister and deputy minister had more than one; the vice president, her husband and their close relatives had at least 25”, and so the list goes on. This second land grab in Zimbabwe was very much a part of Mugabe’s attempt to hold on to power in the face of massive opposition. He rigged elections, caused his opponents to be beaten-up, imprisoned, and killed, and hundreds of thousands of his people fled across borders as refugees. The “jewel” was completely blemished. Bourne’s book is an important contribution to understanding what went wrong in independent Zimbabwe; it is also a good account of all the factors that blighted the country and its people long before Mugabe came to power.